Election Day Ballot Selfies in North Carolina - Don't Do It! Even though I always tell myself I’m going to do less of it, it seems like each day I spend at least part of my evening, as you likely do too, scrolling through my Facebook page, Twitter feed, and Instagram account. And even if you are the most novice social media user, you are already aware that posting selfies to the various social media sites is absolutely the norm. In fact, society probably considers you weird if you’re not doing it. My friends and yours, me and you, we are posting selfies of everything -duckface selfies, post workout selfies, car selfies, bathroom selfies, dressing room selfies, bedtime selfies – literally everything! And with election day looming, you may have even already began to think about what your election day ballot selfie is going to look like. Let’s hope not, but if you have, make sure you don’t make the same voting selfie mistake Justin Timberlake made in Tennessee here in Charlotte, North Carolina. You see, like Tennessee, North Carolina also has laws regulating when, where, and what pictures may be snapped on election day. In fact, as you can see from the image below, many states have some type of laws on the books prohibiting photographs from being taken while voting. Let’s take a closer look at exactly what North Carolina’s laws say about your election day ballot selfie. North Carolina General Statute (N.C.G.S.) 163-166.3 details the applicable law. There are two different parts to this statute that are more than relevant to your election day ballot selfie. We’ll look at each in turn. There are exceptions to this rule. Such a photograph of a voter within the voting enclosure may be taken with permission from the actual voter and the chief judge of the voting precinct. If the voter is a candidate, only permission of the voter is needed to take a photograph. So, you may be thinking “What’s the big deal? What can really happen to me if I violate one of these laws by taking my own election day ballot selfie?” Well, violation of either of the above statutes is a Class 1 Misdemeanor in North Carolina. Depending on your prior criminal record, in addition to a fine in an amount left to the discretion of the judge, punishment for a Class 1 Misdemeanor ranges from unsupervised probation to 120 days’ active jail time. 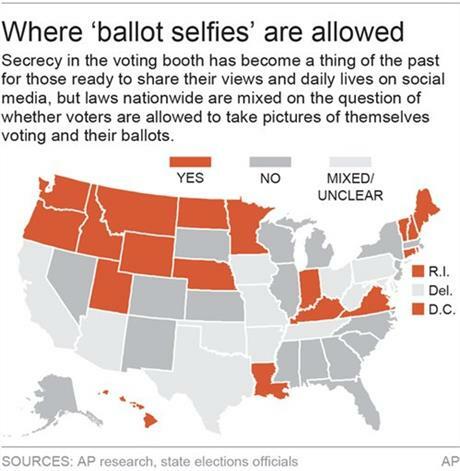 If you ultimately decide to snap that election day ballot selfie, maybe nothing will happen. Maybe you won’t receive a citation, a fine, or jail time. However, after reading this blog, you can’t say you weren’t warned. Don’t take the chance. Instead, once you’re outside and away from your voting precinct, turn your election day ballot selfie into an “I voted” sticker selfie! Your friends, and me, will appreciate it just the same as we spend the evening of November 8th scrolling through all the “I voted” selfies posted to our social media accounts.